Is This Market More Like 1994 Or 1998? In addition to the underlying behavior of the stock market, Nicoski pointed to tariffs, a "growth recession," and developing problems in the emerging markets as a few of the economic similarities to today. We have on a number of occasions indicated that the current rotations are reminiscent of the rotations of 1994. Bill Clinton was President and in that year the Republicans had swept the house under their "Contract with America". Clinton had imposed tariffs on steel imports late in 1993 and with the onslaught of foreign competition, the administration also pushed for punitive tariffs on Japanese autos and auto parts. Investors were reticent on how to respond to such actions. That was also the year that the term "growth recession" was coined as the economy was still growing, but not at the expected rates investors had hoped. In addition to similarities to the 1994 timeframe, emerging markets have recently suffered a blow due to a risk off approach as U.S. interest rates approach multi-year highs. Following the pattern in 1994, tech came out in a leadership position in 1995, Nicoski noted. When we came into 2018, Vermilion highlighted a number of growth-oriented areas of the market that were breaking down, from semis to semi suppliers. Ultimately, though, this was healthy, as we're seeing backing and filling to help consolidate some of the gains that they've had in prior years. For instance, the semi suppliers are not quite breaking out of or breaking those downtrends definitively, Nicoski noted, but the market could rotate back into a growth orientation. With the advance-decline line intact and markets showing stronger breadth, Nicoski stated, the indication is that the market is actually improving, rather than decaying. Vermilion is overweight energy, financials, tech, and healthcare, said Nicoski. Given the positive backdrop he sees, Vermilion is staying with those overweights. Energy may struggle a little bit - but not break down - as we get through the tariff wars, Nicoski said, simply because historically, incremental energy demand is coming from emerging markets. But if these emerging markets bottom, that would be a good catalyst to send energy higher. With regards to financials, large caps have been lagging up until recently. Utilizing the XLF, his line in the sand is a break below 2650. 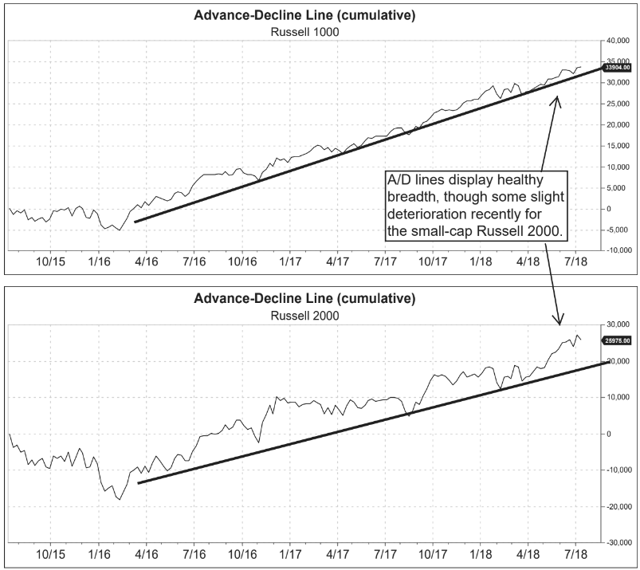 We haven't seen financials fall apart yet, and such a decline would signal trouble for the overall market, but every time we've seen the financials dip 1 to 2 percent below that level, and at every point it felt like it was time to reduce exposure, the financials reversed. Nicoski prefers that the Fed hold back and avoid raising rates unless there's a clear reason to do so, and not just to return to normalcy. The reason for this is, yields in Europe are significantly lower, and anything about 3.1 percent on the U.S. 10-year could have a significant negative impact on global trade. Nicoski doesn't see inflation moving up strongly, and both consumer discretionary and healthcare are standouts right now. However, if the emerging markets make a bottom, we could get inflation moving higher. "My other concern about this market is that the housing market has peaked out," Nicoski said. "The home builders are rolling over. I don't like to see the home builders and the automobile manufacturers (in downtrends). … I want to see them at least stabilize. I think this market could go higher if we had that wind at our back."